Tuesday 16 July marked the anniversary of the first nuclear weapon test carried out by the United States (US) in southern New Mexico in 1945. Between then and September 1992, the US tested 1 030 nuclear weapons – all conducted by the Los Alamos National Laboratory. However, despite President Barack Obama declaring in a speech on 19 June in Berlin that ‘so long as nuclear weapons exist, we are not truly safe’, and his announcement that he intends to seek further bilateral nuclear weapons reductions with Russia, the US’ National Nuclear Security Administration (NNSA) plans to extend the service life of 400 B61 bombs with an estimated cost of $10 billion, or $25 million per bomb. The B61 is the only US nuclear weapon in Europe, with about 180 stored in five NATO countries. Nuclear weapons are the most destructive, inhumane and indiscriminate weapons ever created. Unlike other weapons, they have the potential to not only kill millions of people but also to disrupt the global climate, cause widespread famine and spread genetically damaging radioactive fallout. 1 July 2013 also marked the 45th anniversary of the signing of the Treaty on the Non-Proliferation of Nuclear Weapons (NPT) in Washington, Moscow and London in 1968. Notwithstanding the commitment made by signing and ratifying this treaty, little progress has been made by the permanent members of the United Nations (UN) Security Council – the US, United Kingdom (UK), China, Russia and France – as well as India, Pakistan and Israel to take forward multilateral nuclear disarmament negotiations for achieving and maintaining a world without nuclear weapons. An approach that focuses on the devastating global consequence and impact that the use of a nuclear weapon today would have on humanity. The need to implement measures to reduce the risk of nuclear material and other radioactive material falling into the hands of state and non-state actors who might use such material for malicious acts. It is unlikely that any state or international body could address the immediate humanitarian emergency caused by a nuclear weapon detonation in an adequate manner and provide sufficient assistance to those affected. Historical experience of the use and testing of nuclear weapons has demonstrated their devastating immediate and long-term effects. While political circumstances have changed, the destructive potential of nuclear weapons remains. Although the five nuclear-armed permanent members of the UN Security Council did not attend, this approach is gaining momentum and Mexico has agreed to host a follow-up meeting in early 2014. 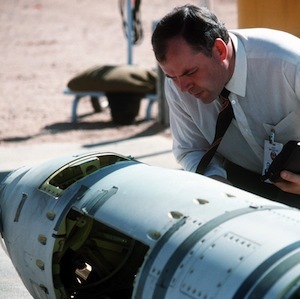 In recent years increasing attention has been paid to the risk of armed non-state actors obtaining nuclear or other radioactive material for malicious acts. The International Atomic Energy Agency (IAEA) has recorded numerous cases of theft and other unauthorised activities involving nuclear and radioactive material. As more countries seek to make use of nuclear energy for their electricity needs, the availability of nuclear material is expected to grow, increasing the risks of illicit trafficking. Radioactive substances of the type held in hospitals also need to be better regulated. Even a relatively small amount of material such as cobalt-60 – used in radiotherapy – could cause serious harm if combined with conventional explosives in a so-called dirty bomb. With this in mind, the IAEA’s recent international conference on ‘Nuclear security: enhancing global efforts’ addressed international nuclear security efforts by reviewing past achievements and current approaches, as well as identifying future trends. Ministers, policymakers and senior officials formulated views on the future directions and priorities for nuclear security. While it was agreed that nuclear security is a national responsibility, the importance of bilateral, regional and international cooperation to enhance national nuclear security regimes was flagged as a crucial means to reduce the threat. In this regard, the ratification and entry-into-force of the Amended Convention on the Physical Protection of Nuclear Material, which obliges countries to protect nuclear material when it is being used or stored and to protect nuclear facilities against acts of sabotage, was prioritised. With more than 1 300 registered participants, including some 34 government ministers and other delegation heads from 125 states, as well as 21 governmental and non-governmental organisations, the conference provided a forum for input into the IAEA’s Nuclear Security Plan 2014–2017 and the longer-term planning and implementation of its nuclear security programme. The Ministerial Declaration arising out of the conference affirmed the central role of the IAEA in strengthening nuclear security globally, and leading coordination of international activities in this field. It also encouraged all states to join and participate in the IAEA Incident and Trafficking Database, the international repository of information about nuclear and other radioactive material that has fallen out of regulatory control. Both approaches – the humanitarian lens to nuclear weapons proliferation and the need to better secure nuclear and radioactive material – have as their basis the recognition that their respective use or misuse is a concern for the whole of humanity; and that the use of a nuclear weapon in conflict by a state or an explosive device containing radioactive material detonated by a non-state actor will have grave humanitarian consequences that will spread beyond national borders.